Old Telugu movie poster for sale of the blockbuster hit film Rowdy Inspector (1992). 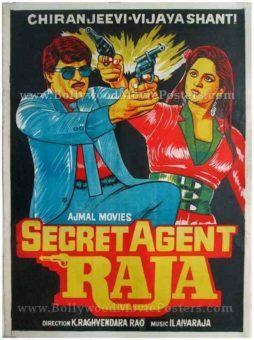 This is an actual surviving old movie poster of the 1992 Telugu film Rowdy Inspector that starred Nandamuri Balakrishna as Inspector Ramaraju and Vijayashanti as Auto Rani. This old Telugu movie poster was designed and printed for publicity of the film during its initial release in the early 1990s but never ended up being used. Vijayashanti is seen in her “Auto Rani” avatar prominently in this old Telugu movie poster for sale. She is seen besides her iconic auto rickshaw bearing the words “Auto Rani” on the numberplate. Rowdy Inspector was a blockbuster hit at the box office. Music for the film, composed by the Disco King of Bollywood Bappi Lahiri was a stellar success. Old Telugu film poster for sale of the blockbuster hit Rowdy Inspector (1992). 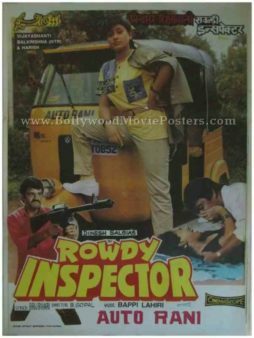 This is an actual surviving old film poster of the 1992 Telugu movie Rowdy Inspector that starred Nandamuri Balakrishna as Inspector Ramaraju and Vijayashanti as Auto Rani. This old Telugu film poster was designed and printed for publicity of the film during its initial release in the early 1990s but never ended up being used. Vijayashanti is seen in her “Auto Rani” avatar in various action scenes prominently in this old Telugu film poster for sale. Her iconic auto rickshaw bearing the words “Auto Rani” on the numberplate is seen on the top of the poster.